Whether or not we actively gamble, we're fascinated by predictions, and the more reckless, the better. Wild prognostication, ideally packaged as bold or cold or hard or whatever, is going to get attention. Pick an unlikely but plausible event to happen, declare a likely but uncertain event to be a lock, or simply choose one side of a coin flip, and your words are going to be gobbled up and regurgitated with exuberance, vitriol, disbelief, hope, or some mix and match of all the above. (Bonus points if you offer to eat something unusual should your bold prediction falter). It's great business. When the weighted random number generator swings your way, you look pretty cool. When it doesn't, most people will have long since forgotten what you said. Unless they don't. You may recall that the Red Sox, thanks to a collapse of their own and a surge by the Rays — two prolonged arcs that converged with astonishing grace at about 12:06 this morning — have been eliminated from postseason contention. You may also recall that, throughout the year, a number of individuals presented with the possibility of Boston making the playoffs (a likely event) aired on the side of certainty. In fact, some of them went way the hell beyond that. Though they emanated mostly from New England and packed a little extra bombast, these predictions weren't all that disparate from the type of stuff that gets said all the time by lots of people about teams all over the place. That said, they're still pretty funny. January 2, 2011: An article at NESN declares, with detail, that the '11 Red Sox will challenge the 1927 Yankees for the distinction of "Greatest Team in Major League History". March 29, 2011: In a poll, less than 5 percent of over 6,500 fan voters pick the Red Sox to miss the playoffs. March 30, 2011: ESPN.com's panel of experts forecast all of the playoff contenders, as well as the World Series competitors and victor. Every one of the 45 experts predicts the Red Sox to win the American League East and make the postseason. What's more, 33 of the 45 pick them to win the World Series. April, 2011: The Red Sox start 2-10; everybody's like, "what?". 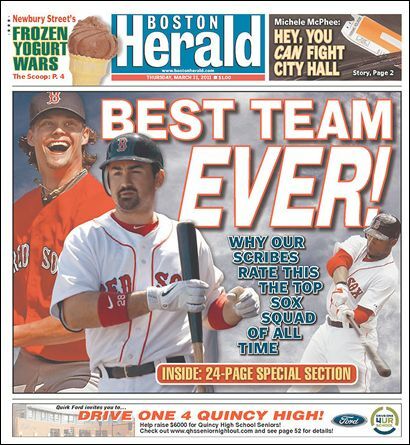 July 2011: The Red Sox have turned things around and are now the second best team in baseball. NESN declares them "on course for history." The Boston Globe asks if they're "a lock" to make the playoffs. Bob Ryan chortles. 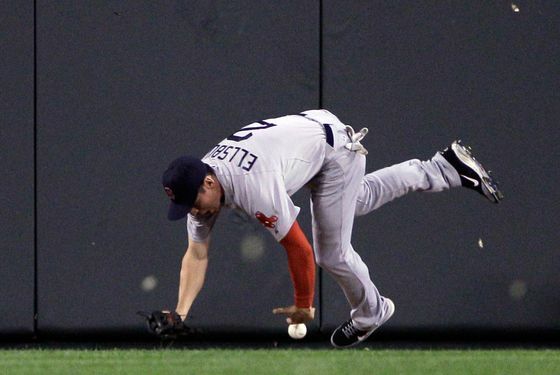 September 2011: The Red Sox collapse. NESN declares them still playoff-bound. Barstool Sports agrees: "Book it". Our own Will Leitch says the Sox "still have very little to worry about". Last week: This is the cover of ESPN the Magazine. Last night, during the Boston–Baltimore rain delay: Dan Shaughnessy proclaims that the "Red Sox season is not going to end tonight". So, yeah. Probability is a fickle beast and predicting can go awry, often to the sinister delight of others. No harm done, though. Really.